Remote sensing, like GIS, excels in integrating across disciplines and people. Whilst no one ever said being a multi-disciplinary scientist was going to be easy, for the ‘thirsty’ mind it challenges, cross pollinates ideas and looks at problems with new eyes. A diverse group of people connected by a common thread of spatial and remotely sensed data found themselves doing all these things and more in London last week at the Wavelength 2017 conference. 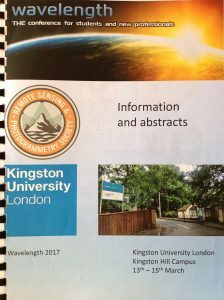 The talks and posters took us on whirlwind tour through the ever varying landscape of remote sensing. We moved through subject areas ranging from detecting ground ice, vegetation and overall land cover, through to earth surface movement and 3D imaging, and onto agriculture yield and drought. We also covered the different vertical scales from which remotely sensed data is collected, whether from satellites, planes, drones or cameras operated from ground level. On top of this focus we also had some great key note talks, running through the varied career of a remote sensing scientist (Groeger Ltd), as well as in depth data assimilation of remote sensing imagery in models (UCL) and commercial developments in airborne camera work (Geoxphere Ltd). In parallel, we were taken on a grand tour covering the temperate UK, parts of the Middle East, the tundra in North America, the central belt of Africa, and even onto the moon and Mars! In many cases we heard talks from scientists from these countries (though not the moon or Mars …). Some are based at the universities in the UK, whilst, others came specifically to talk at the conference. I found myself transfixed by the far flung places. Listening to how the dark side of the moon is being mapped, a place that never sees daylight and is incredibly ‘chilly’ and traps ice in these shadowed lands. I also heard about the CO2 that precipitates out of the atmosphere on Mars as snow and forms a 1m blanket. Working in places like Africa started to feel really quite local and accessible! Possibly the most intriguing aspect of the conference for me, was the advancements that have been made in photogrammetry and how multiple photos are now being used to produce highly intricate 3D models. We saw this applied to cliff morphology and change detection, as well as the 3D point clouds that are produced when modelling trees and vegetation generally. The 3D models aren’t totally complete due to line of sight and other issues. The model visualisations look like an impressionist painting to me, with tree leaves without trunks or clumps of green mass suspended in mid air. However, this does not matter when calculating leaf volume and biomass, as these discrepancies can be worked with and lead to some very useful estimates of seasonality and change. Setting this up is no small feat for the organiser, and PhD student, James O’Connor. He delivered an interesting programme and looked after the delegates well. I can truly say I haven’t been to such a friendly conference before. It was also unique in providing ample time to discuss aspects of material presented, both from talks and posters, and sharing technical know-how. This felt of real value, especially to the PhD students and young professionals this conference is geared towards, but equally myself with experience in only certain fields of remote sensing. I would highly recommend Wavelength, and look forward to seeing what they are planning for 2018! Blog written by Caroline Chambers, Pixalytics Ltd. This entry was posted in Data, Earth Observation, Professional Development, Remote Sensing, Research, UK Space Industry and tagged 3D models, agricultural yiel, conference, GIS, ground ice, remote sensing, satellite photogrammetry, scientists, surface movement, vegetation, Wavelength, Wavelength 2017 by Andy. Bookmark the permalink.